Sonos are pioneers and an old hand in the field of multiroom technology. They started selling these products in the middle of the year 2000 and even these early products worked perfectly fine. Over time, more features were added to the app – the system itself, consisting of a speaker with three buttons, remained unchanged though. In the earlier years at least one speaker had to be connected to the router through an Ethernet cable. An alternative was the Sonos Bridge that did the same job. Based on that, Sonos has developed an own circular network, with its range expanding through every speaker you add – which enables the remarkably reliable and stutter-free transmission of their systems. They stuck to their setup with a cable connecting to the router for a very long time – while other manufacturers, such as Raumfeld or Bose, had advanced to new solutions. Finally, in 2015 they tried a new approach and since then a Sonos network can be set up without a direct Ethernet connection to the router. Sonos has made up ground again. First, the app will ask you to choose your box. Small pictures help identifying the right one. Then you press ''plus'' and ''play/mute'' at the same time until you see the LED turn orange. Now the speaker has set up its own temporary wifi network. Through this network you can connect your smartphone to the speaker and enter your network's access information. To do this, you will have to go to your smartphone's settings and choose the Sonos network. Then you return to the app and enter SSID and password for your home wifi. After the speaker is connected to it, the temporary wifi network will automatically be disabled. Finally, you define the place where the speaker is located – for example ''kitchen''. Also, Sonos require registration of the product – preferably with location information. While some have different opinions about this, I don't really mind telling them my country name and post code. Now setup is complete. 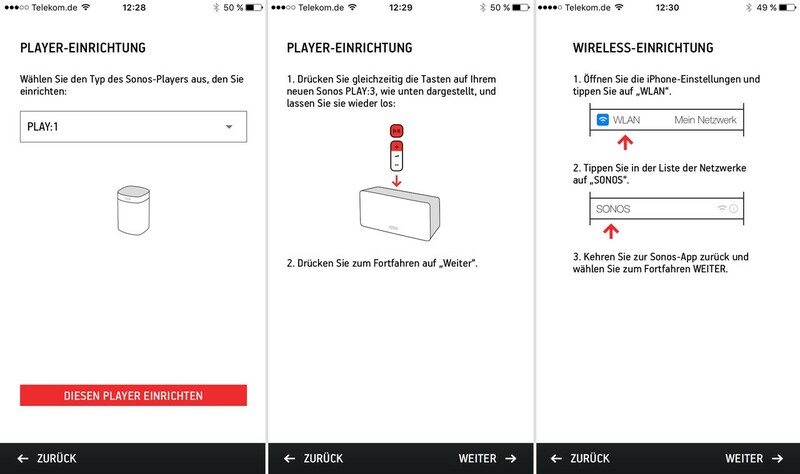 Additional speakers can be added very conveniently: Simply press ''plus'' and ''play/mute'' on the new speaker and add a new speaker in the Sonos app settings. It will be detected automatically. The app is incredibly complex. Integrating all these services sensibly and intuitively is not an easy task. And no other manufacturer supports as many music streaming services as Sonos do. Spotify is set up in no time at all and can be used directly through the Sonos app – you won't be able to use the Spotify app though, which is a minor downside. Bose shows, how the Spotify app itself can be used as some kind of remote control, which I like more. Hopefully, Sonos will follow that idea. Update: Sonos integrated Spotify like Bose. 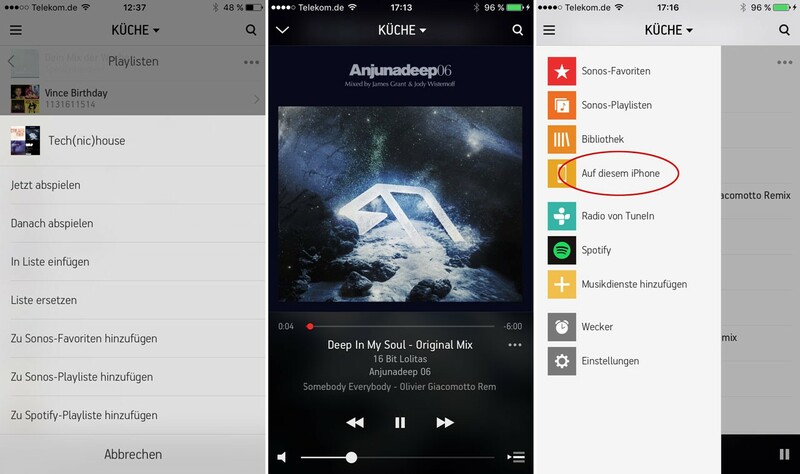 You can easily use the Spotify App and choose a Sonos speaker als playback device. This way, you won’t have to use the Sonos app when browing your spotify tracks. The Sonos app does have a unique feature though: Spotify playlists are automatically imported and can be added to your Sonos favorites. Radio stations can be added, as well. I have also added playlists from my iTunes playlist. In the end you have all playlists and favorites from different services in one place – this is in fact not a given with other systems. The neatly arranged Sonos controller app is exemplary. Another extraordinary feature is the Sonos playlist. It can be defined for single speakers individually or for all speakers together. The Sonos server stores all Songs ever played in this playlist. Therefore it grows with every song played – perfect for musical hoarders. This playlist can be sorted, edited or completely deleted, just like a Spotify playlist. Of course, songs will not really be deleted but just removed from the Sonos server, so that you will have to load them from the respective playlist again to play them. So the Sonos playlist is practically a playback log – if you never delete it, you may jump back in time or have the same music played again every day. If the playlist is good or if you want to keep it for later, it can also be saved – brilliant! The long term upsides of this feature are hard to describe but can be experienced after using the system for a while. For a long time it was not possible to play back music directly from the iPhone. Many users asked for an AirPlay feature for convenient streaming of songs. Sonos failed to respond, though. In another article I am describing how to set up AirPlay on Sonos – which I personally do not recommend, because playback will stutter. After some years Sonos finally came up with a solution to the problem. It is not exactly easy, but it works. You will need to use the Sonos app again and find the navigation item ''on this iPhone''. All songs are listed here – as well as playlists and podcasts. This is convenient, indeed, but once you start streaming music you will strain your phone battery. 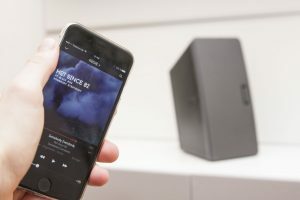 Therefore I recommend importing and playing the songs with Spotify instead of using AirPlay: The Sonos speaker will independently stream the music, while the phone could theoretically be switched off then. While the software is flawless and exemplary, the speaker hardware comes with a small downer. Of course, it is of good build quality and has an outstanding sound. The simple system of ''volume up/down'' and ''play/mute/pause'' is usually a good solution, as well. But often I would rather have direct choice buttons, so I could easily play radio without having to unlock my iPhone. Now I always have to use the app. Would it be so difficult to put six buttons on the device, to which songs, playlists and radio stations could be assigned? In this respect Bose is clearly ahead.